Note: some links on this page will have expired, as the news is no longer topical. Some remain active for only a couple of days. Stories from Spaceweather.com are changed every day - ensure you have the Dateline date in the Archives calendar at upper right of the Spaceweather home page for any story. Stories from previous days can also be accessed through the Archives calendar. Simply enter the month, day and year as shown in the Dateline of the required story. If a link does not open, it may be because your browser is blocking pop-ups. If so, a message to that effect will appear on the screen. To open the link, left-click on it while holding down the Ctrl key. Note: Some parts of this webpage may be formatted incorrectly by Google Chrome. Saturday, 23 December, 2017: The ISS will appear 36� above the west-north-western horizon at 7:01 pm and will reach a maximum elevation of 67�. It will disappear into the Earth's shadow when 10� above the south-eastern horizon. In this flyover, the ISS will be visible for 4 minutes. Images from space of the December 26, 2004 tsunami are available here, here and here. Latest Astronomical Headlines from the IAU (International Astronomical Union): Click here. Massive sunspot AR2738 is sending bursts of radio energy toward Earth strong enough to make audible noises in the loudspeakers of common shortwave receivers. An amateur radio astronomer in New Mexico recorded some of the bursts this weekend - and they sound like ocean surf. Visit today's edition of Spaceweather to hear the sounds and find out how you can detect them in your own backyard. This weekend, one of the largest sunspots in recent years is directly facing Earth. The behemoth is not producing strong flares, but it is doing something rare and interesting. A canyon of light (called a 'light bridge') is opening inside the sunspot's dark core, presaging a possible disruptive breakup. The scale of the spot makes it an easy target for amateur astronomers with properly-filtered backyard telescopes. Visit today's edition of Spaceweather to learn more. We all use GPS - to find ourselves in the back country, to navigate to the grocery store, to locate lost pets. NASA's four MMS spacecraft recently used the same system to locate themselves an astonishing 187 167 kilometres (116 252 miles) from Earth, almost halfway to the Moon. This shatters previous records and expectations of how far away GPS can work. Visit today's edition of Spaceweather to find out how they did it. Dateline - 28 March 2019 - Can humans sense geomagnetic storms ? New research published by neuroscientists at Caltech shows that sudden changes in Earth's magnetic field affect human brainwaves - specifically, depressing alpha waves associated with wakeful relaxation. This raises the possibility that humans can sense geomagnetic storms. Learn more about the link between human biology and space weather on today's edition of Spaceweather . Sunspot AR2736, which hurled a CME toward Earth yesterday, is growing larger and crackling with C-class solar flares. The active region now sprawls across more than 100 000 km of the solar disc and contains multiple dark cores as large as Earth, making it one of the biggest sunspots in recent years. Visit Spaceweather to watch a movie of the growing spot and to find out what makes it so explosive. A new and rapidly growing sunspot, AR2736, announced itself this morning with a C4-class solar flare. The Earth-directed explosion sent minor waves of ionisation rippling through Earth's upper atmosphere and caused a shortwave radio "brownout" over parts of Europe and Africa. Moreover, the explosion hurled a coronal mass ejection (CME) into space, which might deliver a glancing blow to Earth's magnetic field later this week. Visit Spaceweather for updates. Want to experience space weather? Just step on board an airliner. Flying above 30 000 feet (9144 metres) can expose passengers to potentially significant doses of cosmic rays. We have just conducted a new survey of radiation on flights over five continents and, using bubble chambers, have detected an abundance of deep space neutrons. Learn more about this biologically effective form of cosmic radiation on today's edition of Spaceweather . The Sun has just passed an entire calendar month with no sunspots. The last time this happened, in August 2008, the sun was in the nadir of a century-class Solar Minimum. The current stretch of blank suns shows that Solar Minimum has returned, and it could be as deep as the last one. Visit Spaceweather for more information and current sunspot counts. A large hole in the Sun's atmosphere is facing Earth and sending a stream of solar wind in our direction. Minor G1-class geomagnetic storms are likely when the gaseous material arrives on February 27 - 28. Solar wind speeds could top 500 km/s (1.1 million mph), sparking auroras around the Arctic Circle and possibly even from latitude +45� north. Visit Spaceweather for updates. Sunspot numbers remain very low as the Solar Minimum continues. Nevertheless, there is some big activity on the Sun today. Really big. NASA satellites and amateur astronomers are monitoring a giant filament of magnetism jutting out from the edge of the solar disc. The glowing structure is fully one-tenth of the Sun's diameter. Visit today's edition of Spaceweather to watch a movie of the unstable prominence. Exploration of Mars by spacecraft has unaccountably suffered from a high	attrition rate,	with 70% of vehicles failing before	completing their missions. Yet there have also been spectacular successes, as with the Mars Rovers Spirit and Opportunity which landed on the red planet in 2004. The designed life expectancy of both rovers was 90 days and one kilometre, for it had been expected that dust would accumulate on their solar panels within a few months, preventing them from providing electricity. Serendipity played a part, for it seems that regular whirlwinds kept the panels clean and functioning normally. Although Spirit became stuck in sand and went silent after 5.3 years on Mars, Opportunity continued moving about on the surface and beaming back signals and pictures to Earth until 2018. But in mid-2018, "Oppy's" luck ran out. In June last year a severe planet-wide dust storm overtook the rover�s location and its final touching message on June 10 was �My batteries are low and it�s getting dark.� After the storm, the batteries failed to recharge and although over 1000 attempts were made over the next eight months, communication with Oppy was never restored. On February 13, 2019, NASA declared Opportunity�s mission at an end, after 14.3 years work and travelling 45 kilometres. A third rover, Curiosity, arrived on Mars in 2012 and is now in its seventh year of operation. It is nuclear-powered	and does not need solar panels. It was therefore unaffected by the dust storm and is working normally. The lander InSight touched down on Mars on November 26, 2018 after the dust storm had abated. Like Opportunity, it generates electricity from solar panels, but unlike the rovers has no wheels and is therefore fixed in position. Google "Opportunity rover" for more. In only a few days, newly-discovered Comet Iwamoto will split the orbits of Earth and Mars, making a relatively close approach to our planet visible through small telescopes. This is a rare visit. The comet comes from the realm of Extreme Trans-Neptunian Objects, a distant region of the solar system inhabited by strange objects such as "Sedna" and "the Goblin." Get the full story on Spaceweather . The Northern Lights (Aurora Borealis) get a lot more publicity than the Southern Lights (Aurora Australis) as they are seen by the populations of Northern Europe, Russia, Canada and the USA. Yet the Southern Aurora is just as spectacular (sometimes more so) but there are not many people living in those far-south latitudes to report on them. However, they are regularly seen in Tasmania, New Zealand, Chile and southern Argentina. Occasionally they can be seen from Victoria, New South Wales, South Australia and South Africa, but only during the winter months and in periods of strong solar activity. Cold-weather astrophotography pioneer Robert Schwarz has just released a new video of Southern Lights dancing over the Amundsen-Scott South Pole Station, taken over a period of fourteen winters. The short movie (just under 6 minutes long) is a must-see for anyone interested in aurorae and space weather. It highlights the otherworldly effect of geomagnetic activity on our planet's south polar skies with scenes unlike anywhere else on Earth. The video is featured on today's edition of Spaceweather . Sometimes the camera is fixed on a tripod at the South Pole itself and shows the stars wheeling around the horizon with the coloured bands and curtains of the aurora shimmering in front of them. Other sequences have the camera tracking the stars, and give a wonderful view of the Earth and the South Pole buildings rotating against the fixed background of the distant Milky Way with its rich star fields. A large hole in the Sun's atmosphere is facing Earth and ejecting a stream of solar wind in our direction. Polar geomagnetic storms are likely when the gaseous material arrives on January 31 or February 1. We've seen this hole before. Visit today's edition of Spaceweather to find out what happened the last time it lashed our planet with solar wind. During yesterday's total lunar eclipse (not visible from Australia, but listed in our The Sky Tonight page), a meteoroid slammed into the Moon. We know this because many amateur astronomers witnessed the explosion. The fireball was visible against the shadowy backdrop of an eclipsed Moon. Visit today's edition of Spaceweather for images, video, and the full story. Earth's magnetic field is changing so quickly that researchers have been forced to update to the World Magnetic Model ahead of schedule. Developed by NOAA and the British Geological Survey, the model is widely used for precision navigation of devices ranging from nuclear submarines to the common smartphone. Your own phone may be affected. Find out how on today's edition of Spaceweather . Something violent just happened in the asteroid belt. Not far beyond the orbit of Mars, asteroid 6478 Gault appears to have been struck by another asteroid. The resulting stream of debris stretches more than 400 000 kilometres, which is greater than the distance between Earth and the Moon. Astronomers around the world are now monitoring the formerly unremarkable asteroid to see what happens next. Get the full story on today's edition of Spaceweather . Venus and Jupiter are converging for a beautiful conjunction in Ophiuchus, the unofficial "13th constellation of the zodiac." The two bright planets are easy to see even from light-polluted urban areas and are being photographed by many observers surrounded by the morning-glow of sunrise. At closest approach on January 21-22, they will be only 2.5 degrees apart, and visible even from brightly-lit cities. Visit today's edition of Spaceweather for sky maps and observing tips. Scientists from NASA's New Horizons mission have released the first detailed images of Ultima Thule, the most distant object ever explored. Its remarkable appearance, consisting of two primitive spheres stuck together in the middle, is unlike anything we've seen before. Visit today's edition of Spaceweather for photos and more information. NASA's New Horizons spacecraft is now only hours away from Ultima Thule, a mysterious elongated object in the distant Kuiper Belt. At 3:33 pm AEST (Queensland time) on January 1 (today), New Horizons will swoop past Ultima Thule three times closer than it buzzed Pluto in 2015. Radio signals and data acquisition from the encounter will take about 10 hours to reach Earth, so information and pictures from the flyby will not be received until about 1:30 am on Tuesday, January 2 (our time). More information and links to live coverage are available on today's edition of Spaceweather . Solar Minimum is in full swing. No sunspots? No problem. Last night the spotless sun produced a G1-class geomagnetic storm with bright auroras reported from Iceland to Alaska. More lights are in the offing as a stream of solar wind is expected to buffet Earth's magnetic field for the next 24 to 48 hours. Get the full story from Spaceweather . In Antarctica, Christmas lights are electric blue. Noctilucent clouds glowing with the azure color of an electrical discharge are swirling around the South Pole, blanketing almost the entire frozen continent, according to new images from NASA's AIM spacecraft. Visit today's edition of Spaceweather to learn more about these clouds and how they may connect to winter weather in the USA. Dateline - 22 December 2018 - Is Ultima Thule surrounded by mini-Moons ? Long range images have revealed something strange about Ultima Thule, the distant Kuiper Belt Object that NASA's New Horizons spacecraft is approaching for a New Year's Day flyby. Although it is almost certainly irregular in shape, the brightness of Ultima Thule does not seem to change as it rotates in sunlight. One possible explanation: A swarm of 'mini-moons' surrounding it. Visit today's edition of Spaceweather for the full story. NASA's New Horizons spacecraft is about to make history - again. The distant probe is less than two weeks away from "Ultima Thule," a strangely elongated object in the distant reaches of the solar system. On New Year's Eve, New Horizons will fly past Ultima Thule three times closer than it buzzed Pluto in July 2015, giving scientists their first close-up look at a small Kuiper Belt Object. Visit today's edition of Spaceweather for the full story. The image below shows Comet 46/P Wirtanen near perihelion on December 12, 2018, at 00:55 am. It was faintly visible to the unaided eye, but easily visible through binoculars. Today it will move from the constellation Cetus into Taurus. Comet 46/P Wirtanen was faintly visible to the unaided eye, but easily visible through binoculars. The circled star has a magnitude of 15.77, and the brighter one just to its left is GSC 60:1162, magnitude 13.8. The comet is moving north-east, or to the right. Its position at the time of the photograph was RA = 3 hr 23 min 13 sec, Declination +4� 34' 31". 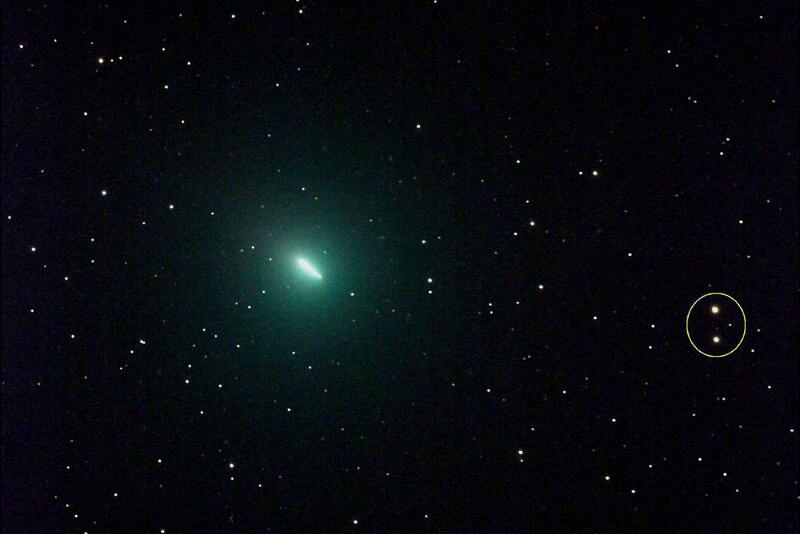 The comet may brighten as it passes by the Earth on December 16. Width of field = 18.6 arcminutes. The annual Geminid meteor shower is underway as Earth enters a stream of gravelly debris from 'rock comet' 3200 Phaethon. The peak night is expected to occur on December 14-15 with 60+ meteors per hour. Last night, a photographer in Missouri caught an early Geminid disintegrating next to approaching Comet 46P/Wirtanen - a scene that could be repeated many times in the nights ahead. The video and observing tips are highlighted in today's edition of Spaceweather . Today at the American Geophysical Union meeting in Washington, NASA announced that Voyager 2 has exited the sun's magnetic bubble and entered interstellar space. The 70s-era probe is now experiencing a blizzard of galactic cosmic rays as it charts the unexplored space between the stars. See the data and learn more on today's edition of Spaceweather for the full story. China is going where no one has gone before, to the far side of the Moon. Today, a Long March 3B rocket is scheduled to blast off from the Xichang Satellite Launch Centre, propelling a lander and rover toward craters hidden from Earth that may possibly contain water and other resources. This would be important for future human exploration pf the far side. If the mission succeeds, it will catapult China into the forefront of lunar exploration with a landing that no other nation has yet attempted. Visit today's edition of Spaceweather for the full story. Hyperactive Comet 46P/Wirtanen is approaching Earth for one of the closest Earth-comet encounters of the Space Age. Observers report that the comet's gaseous green atmosphere now covers a patch of sky as large as the full Moon, and it is growing larger. Of course, the solid nucleus of the comet is much smaller, only 1.2 km across. Current predictions are that it will reach magnitude 3.9 on December 15, which means that will appear as a large, faint cloud about a degree across in the constellation of Taurus, near the Hyades and Pleiades star clusters. As this date coincides with a First Quarter Moon, the best way to observe this comet will be with binoculars or small telescope taken to a dark site well away from city lights, and observations made around midnight. Comet Wirtanen presents no danger to the Earth. Sky maps and expert observing tips are featured on today's edition of Spaceweather and here . Comet 46/P Wirtanen on November 30, 2018. This image is a stack of five exposures between 8:13 and 9:05 pm. The comet's movement over the 52 minute period can be seen, the five images of the comet merging into a short streak. It is heading towards the upper left corner of the image, and is brightening as it approaches the Sun, with perihelion occurring on December 12. 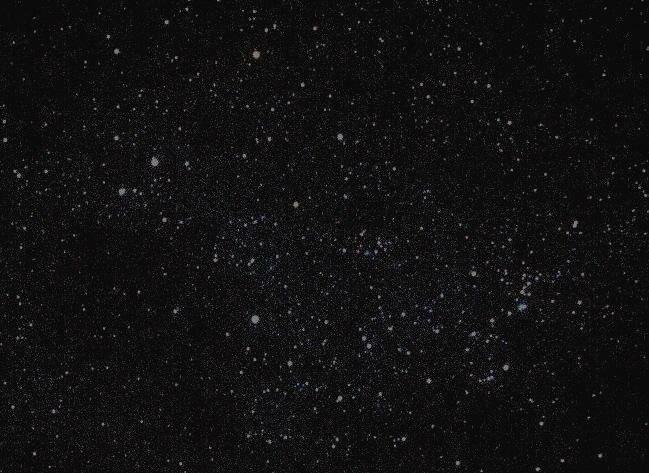 The images of the stars in the five exposures overlap each other precisely. The length of the streak indicates that the comet is presently moving against the starry background at 1.6� per day. The comet at 9:05 pm was at Right Ascension = 2 hrs 32 min 56 secs, Declination = 20� 27' 20". The upper star in the yellow circle is SAO 167833, magnitude 8.31, the same one circled in the picture below but with higher magnification. A small but hyperactive comet named "46P/Wirtanen" is nearing Earth for one of the 10 closest approaches by any comet of the Space Age. Wirtanen's emerald green atmosphere is now larger than the full Moon, and it is an increasingly easy target for binoculars and small telescopes. Currently at magnitude 6, naked-eye viewing could be just around the corner. It will reach its closest to the Sun (perihelion) on December 12, and then head in our direction. It will pass the Earth at a distance of 11.5 million kilometres (30 times as far away as the Moon) on December 16. In the week preceding, it will be at its brightest. On the night of November 29-30, it will be near the sixth magnitude star SAO 167839, which lies near the junction of the constellations Cetus, Eridanus and Fornax. It will be 4.3 degrees north of the zenith at 9:50 pm. The comet will therefore be visible for most of the night. In the coming weeks it will head rapidly north-north-east, passing 4.7 degrees east of the second magnitude star Menkar and crossing into Taurus on December 11. It will pass between the Pleiades and Hyades star clusters on the night of December 19-20, heading towards the star Capella in Auriga, which it will pass on December 24-25. This could be an exceptional flyby. Visit Spaceweather and here for more information and charts. Declination = 21� 43' 13". The nearest star to the comet's position, just to its left, is GSC 5862:549, magnitude 14.1. The spiral galaxy near the right margin is NGC 908. InSight landed on Mars on November 27, 2018 at 5:52:59 am, Australian Eastern Standard Time (Queensland time). The entry, descent, and landing (EDL) phase began when the spacecraft reached the Martian atmosphere, about 128 kilometres above the surface, and ended with the lander safe and sound on the surface of Mars six minutes later. For InSight, this phase included a combination of technologies inherited from past NASA Mars missions such as NASA�s Phoenix Mars Lander. This landing system weighed less than the airbags used for the twin rovers or the skycrane used by the Mars Science Laboratory. The lean landing hardware helped InSight place a higher ratio of science instruments to total launch mass on the surface of Mars. For more information see the NASA report or the ABC News coverage. Earth is entering a stream of debris from Comet 55P/Tempel-Tuttle, source of the annual Leonid meteor shower. NASA cameras have already detected a number of Leonid fireballs over the USA with peak rates expected on their November 17 and 18. The weekend display is best seen at dawn alongside a new comet and a conjunction between Venus and the brightest star of Virgo (Spica). Visit Spaceweather for the full story. In modern astronomy, most comets are found by large mountaintop telescopes photographing the skies under computer control. The photographs are scanned automatically to look for any new object that is not on the databases, such as an asteroid or comet. These on-going robotic surveys discover most new comets before they are bright enough for amateur astronomers to catch them. Surprisingly, three amateur astronomers (one in Arizona, two in Japan) have just discovered a bright new comet in the constellation Virgo that somehow escaped the notice of the automated surveys. This morning it was near the magnitude 2.9 star Porrima (Gamma Virginis), and heading east through the background stars. It will be near the magnitude 3.38 star Zeta Virginis on November 18. Named Comet Machholz-Fujikawa-Iwamoto after the three discoverers, it is plunging toward the Sun and could brighten to naked-eye visibility later this month. It will be at its closest approach to Earth on November 27 and closest approach to the Sun on December 4. The best time to observe it from November 13 to November 18 will be from 4 am to the first light of dawn, close to the due east horizon, and a little over half a handspan to the left of Venus. As the days go by and it becomes closer to the Sun, it will become lost in the solar glare. Visit today's edition of Spaceweather for the full story. This is the 12th comet discovered by Don Machholz of Arizona, who is the world's most successful living visual comet hunter. He found his 11th comet in 2010. It took 746 hours searching over eight years to capture the latest one. November 17 to 19, after the waxing gibbous Moon has set. The meteors appears to radiate from the direction of the constellation Leo the Lion, hence the name. More precisely, they come from the direction of the third magnitude star Adhafera, in the Lion's mane. These meteors are debris from Comet Tempel-Tuttle. Meteoroids are small rocky or metallic bodies in the Solar System, left over from the creation of the planets. Some are produced by impacts of asteroids with the Moon, Mars or other solid Solar System bodies. Their sizes range from about a metre to a grain of sand. If they are smaller than a sand grain they are called 'micrometeoroids' or 'space dust'. The Earth encounters thousands every day. They enter our atmosphere at a speed averaging 20 kilometres per second or 72000 kilometres per hour. Friction with our atmosphere burns them up immediately at an average height of 70 to 90 kilometres, producing a streak of light called a 'meteor' if they occur at night. Sometimes a faint trail of smoke persists for a minute or so. The resulting dust and ash floats down to the Earth's surface and settles on the ground. Much of our topsoil contains this interplanetary material. The Earth attracts about 40 tonnes of meteoric material every day. Large meteoroids may not burn completely away and can survive to hit the ground where they can be collected. Once they are on the ground they are called 'meteorites'. Two people were struck by meteorites in the last century - both survived the experience. Meteorites are not rare and most museums have a collection. There are usually small examples for sale on ebay. NASA's Solar Dynamics Observatory is monitoring a large hole in the Sun's atmosphere, now directly facing Earth. A stream of solar wind escaping from the opening is expected to reach our planet during the early hours of November 4, possibly sparking minor G1-class geomagnetic storms over the weekend. Visit Spaceweather for more information and updates. Right now, specks of dust from Halley's comet are disintegrating in Earth's atmosphere, kicking off the annual Orionid meteor shower. Forecasters expect the shower to peak this weekend with 20+ meteors per hour appearing to radiate from the constellation Orion. The nearly full Moon could reduce visibility, but it is possible to avoid the glare if you look at the right time. Visit today's edition of Spaceweather for sky maps and observing tips. Get ready for a very nice comet. In exactly two months, Comet 46P/Wirtanen will sweep past Earth, making one of the ten closest approaches of a comet to our planet since 1960. If forecasters are correct, Comet Wirtanen could become visible to the naked eye for weeks in this coming December. The small but unusually active comet will come closest to Earth just four days after its closest approach to the Sun, and it will be "up" all night long, making this an exceptional flyby. Visit Spaceweather for more information. On October 8-9, European sky watchers were amazed when a flurry of faint meteors filled the sky at midnight. It was an outburst of the annual Draconids meteor shower. Turns out, that outburst was just the tip of the iceberg. Computer models show that Earth narrowly missed two streams of comet debris that would have caused significant meteor storms had they struck our planet. Visit Spaceweather for the full story. For centuries, people inside the Arctic Circle have reported hearing strange hissing and popping sounds under the Northern Lights. Evidence is mounting that at least some those auroral sounds are real. On October 7, a researcher in southern Finland recorded some during a G1-class geomagnetic storm - the latest in a series of detections by the long-running Auroral Acoustics Project. Visit today's edition of Spaceweather to hear a sample "geomagnetic thunderclap." The sun is entering a deep Solar Minimum, and Earth's upper atmosphere is responding. Data from NASA's TIMED satellite show that the thermosphere (the uppermost layer of air around our planet) is cooling and shrinking, literally decreasing the radius of the atmosphere. If current trends continue, the thermosphere could set a Space Age record for cold in the months ahead. Visit today's edition of Spaceweather for the full story. Yesterday, the Japanese space agency made history by landing a pair of robots on diamond-shaped asteroid Ryugu. The tiny explorers are now hopping across the space rock's rugged surface and sending unprecedented pictures back to Earth. Ryugu is a near-Earth asteroid that can approach our planet closer than the Moon, so exploring it is important. Learn more on today's edition of Spaceweather . NOAA forecasters have issued a watch for G2-class (moderately strong) geomagnetic storms on September 11 when a fast-moving stream of solar wind is expected to hit Earth's magnetic field. During G2-class storms, aurorae can appear in the southern Australian states and New Zealand. Visit Spaceweather for more information and updates. 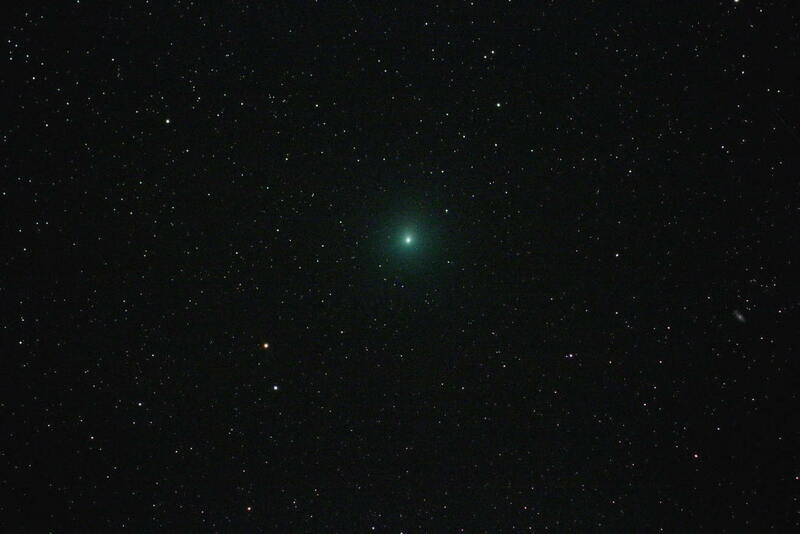 The beautiful green Comet 21P/Giacobini-Zinner is approaching Earth for a 58 million kilometre close encounter in early September, when it is expected to approach naked-eye visibility. This small but active comet is the parent of the annual Draconid meteor shower, a display that typically peaks on October 8, less than a month after the comet's 2018 flyby. Visit Spaceweather for more information about 21P and where to point your telescope as it approaches. The Parker Solar Probe will help scientists learn more about the solar wind, an exotic brew of magnetic forces, plasma and particles. NASA has a ScienceCast Video on this topic. The Moon is about to take a bite out of the sun. On Saturday, August 11, there will be a partial solar eclipse visible from locations around the Arctic Circle and across much of Asia. During the 3+ hour event, as much as 73% of the solar disc will be covered. Visit Spaceweather for more information about this event. Earth is entering a stream of debris from giant comet 109P/Swift-Tuttle, parent of the annual Perseid meteor shower. Although the shower is not expected to peak until next weekend, NASA all-sky cameras are already detecting dozens of Perseid fireballs every night. This early activity may be a good omen for the nights ahead, especially August 11-14 when the Earth is expected to pass through the densest part of the comet's debris zone. Visit Spaceweather for more information and observing tips. A large hole has opened in the sun's atmosphere and it is spewing a stream of solar wind toward Earth. NOAA forecasters estimate a 65% chance of minor geomagnetic storms when the gaseous material arrives on July 24th. Such holes are primary sources of solar activity during solar minimum, both forming and staying open longer when sunspots are absent. Learn more on today's edition of Spaceweather . Mars is approaching Earth for a 15-year close encounter on July 27. The Red Planet is now so bright, it is experiencing forms of atmospheric optics normally reserved for objects like the Sun and Moon. Yesterday, an astronomer in Sweden watching Mars witnessed a rare green flash. Visit today's edition of Spaceweather for a video of the phenomenon and more information about the martian brightening. On the heels of a new study showing that flight attendants have an elevated risk of cancer compared to the general population, a team including representatives of Spaceweather.com and the students of Earth to Sky Calculus recently boarded a plane in Los Angeles and flew to Brisbane carrying an array of cosmic ray sensors. During their 13 hour flight across the South Pacific, the team detected secondary cosmic rays in the passenger compartment almost 40 times stronger than on the ground below. Their "haul" of radiation included a significant number of neutrons captured in portable bubble chambers. The radiation, which included x-rays and gamma rays, almost doubled over the Coral Sea and the approaches to Brisbane. Read today's edition of Spaceweather for the full story. A comet that could become visible to the naked eye in August has exploded in brightness, suddenly increasing its luminosity 16-fold. Whatever happened on Comet PANSTARRS (C/2017 S3) on July 1 has given it an expanding green atmosphere almost twice the size of the planet Jupiter. Visit today's edition of Spaceweather and later entries for pictures and more information about this approaching comet. A martian dust storm that started in late May, silencing NASA's Opportunity rover, has now wrapped itself around the entirety of Mars, radically transforming the appearance of the Red Planet. Amateur astronomers are taking pictures of the storm through backyard telescopes, and even naked-eye observers say they can see changes in the planet's colour. Visit today's edition of Spaceweather for more information and animations. Yesterday, sunspot AR2715 did not exist. Today, it sprawls across more than 60 000 kilometres of solar surface with a primary dark core wider than the Earth. So far, the active region has not produced any big flares, but this could change if its development proceeds apace. Visit today's edition of Spaceweather for a video of the sunspot's genesis and information about how it fits into the Solar Minimum. Yesterday, NASA lost contact with the Opportunity Mars rover as a ferocious dust storm spreads around the Red Planet. Thick dust has turned day into night at Opportunity's work site in Perseverance Valley, blocking sunlight to the solar powered rover. Currently on the verge of circumnavigating Mars, the storm is so large that amateur astronomers can now see it through backyard telescopes. Visit today's edition of Spaceweather for an animation of the spreading storm and more information. Mars is approaching Earth for an almost once-in-a-generation close encounter in late July. This week, the brightness of Mars surpassed that of Sirius, making the Red Planet brighter than any star in the night sky. If you are outside at 9 pm, you can't help noticing Mars as a bright, orange, star-like object low to the east-south-eastern horizon, and the show is about to get much better. Visit today's edition of Spaceweather for the full story. A small asteroid hit Earth on Saturday, June 2, exploding in the atmosphere over Botswana before it could reach the ground. The Catalina Sky Survey in Arizona had discovered the space rock only hours earlier as it hurtled toward our planet from inside the orbit of the Moon. Sensors used to monitor rogue nuclear explosions detected the asteroid's detonation and estimated its strength to be about the same as 480 tonnes of TNT. Visit today's edition of Spaceweather for the full story. Eight years ago, astronomers lost a near-Earth asteroid. They just found it. The space rock, named 2010 WC9, is approaching Earth for a close encounter on Tuesday, May 15. There's no danger of a collision, but the ~100 metre wide asteroid will be near enough for amateur astronomers to photograph. Visit today's edition of Spaceweather for the full story. Last night, the normally dark skies of Chile's Atacama Desert lit up with rippling bands of red light. It looked like the aurora borealis, but it was not. A photographer recorded the unusual apparition of red airglow, so bright that it outshined parts of the Milky Way. Visit today's edition of Spaceweather for photos and an explanation of this phenomenon. Over the weekend, a solar wind stream engulfed Earth, sparking stronger-than-expected G2-class geomagnetic storms. At the peak of the storms, STEVE appeared. The strange ribbon-like aurora travelled south and was sighted in multiple US states. Visit today's edition of Spaceweather to see pictures and learn more about STEVE (see also Dateline - 11 April 2018 below). So far in 2018, the Sun has been blank more than half the time. Whole weeks have gone by without a single sunspot. Although forecasters have been expecting sunspots to disappear with the approach of Solar Minimum, it is happening faster than predicted. Visit today's edition of Spaceweather to see the data and to find out what it means, here on Earth. On the night of April 30 - May 1, (next Monday night), the Moon and Jupiter will converge in the constellation of Libra for a special conjunction. Jupiter is approaching Earth for a close encounter in early May, making the giant planet a little bigger and brighter than usual. On Monday night, April 30, the Full Moon will glide past the brightening gas giant. It adds up to a display of rare brilliance in the midnight sky. Visit Spaceweather for sky maps and more information. With little warning, on Sunday, April 15, a "Tunguska-class" asteroid about the size of a football field flew through the Earth-Moon system. 2018 GE3 was discovered just the day before as it plunged inward from the asteroid belt. A quick-thinking amateur astronomer in Europe was able to record a video of the asteroid as it flew by. Visit today's edition of Spaceweather to see the movie and to learn more about this surprise visitor. Last night in parts of Canada, dogs started barking at the midnight sky. The canines were responding to a bright purple ribbon of light - also known as "STEVE" ("Strong Thermal Emission Velocity Enhancement") The apparition, which occurred during a G1-class geomagnetic storm, was so long-lasting that at least one onlooker had time to capture rare video of the phenomenon. Visit today's edition of Spaceweather to see STEVE in motion. A minor G1-class geomagnetic storm is in progress on April 11th as Earth moves through a high speed stream of solar wind. This is causing bright auroras around the poles, with Northern Lights sighted as far south as the Dakotas in the USA. The gaseous material is flowing from a wide hole in the sun's atmosphere--so wide that the stream could continue to influence our planet for the next two to three days. Visit Spaceweather for updates. Red sprites (also known as "space lightning") are dancing over thunderstorms in Europe. A dedicated observatory spotted the eerie red forms shooting up toward the Pleiades on April 4, marking an unusually early start to the northern summer season for sprites. Today's edition of Spaceweather explores the possibility that this development is related to recent increases in galactic cosmic rays. China's Tiangong-1 space station is about to return to Earth - as a massive fireball. Low solar activity kept Tiangong-1 in orbit longer than officials predicted, but it's finally coming down. The European Space Agency says the 8-tonne craft should re-enter sometime between March 30 and April 2, a window of uncertainty which will narrow in the days ahead. Visit Spaceweather for more information and ground tracks. On March 18, an unexpected crack opened in Earth's magnetic field, sparking a brief but potent G2-class geomagnetic storm. Bright aurorae ringed the Arctic Circle while, in Europe, the light show descended as far south as Germany. With the northern vernal equinox less than a day away, this is the time of year when such cracks tend to form. Today's edition of Spaceweather explains the phenomenon of magnetic cracks and how you can monitor them online. World renowned physicist and cosmologist Stephen William Hawking has died peacefully at home in Cambridge at the age of 76. He was the first to unite Einstein's theory of relativity with quantum mechanics, to produce a new theory of cosmology which included black holes and relativistic effects. With the mathematician Roger Penrose, he proposed in 1970 that the universe began as a singularity. If he had been able to support his theories by performing practical observational work, he would have been certain to win a Nobel Prize in Physics. Hawking wrote several popular science books including the best-seller "A Brief History of Time". At the age of 22, as a student at Cambridge University, he was diagnosed with a rare form of motor-neurone disease and given only a few years to live. The illness progressed slowly and left him wheel-chair bound, and later almost completely paralysed. He was virtually unable to speak and was forced to communicate via a voice synthesiser (using one cheek muscle to operate a mobile computer). Yet he met two US Presidents, flew at zero gravity in a special plane, and fathered three children, Lucy, Robert and Tim, who said: "We are deeply saddened that our beloved father passed away today. He was a great scientist and an extraordinary man whose work and legacy will live on for many years." They praised his "courage and persistence" and said his "brilliance and humour" inspired people across the world. This morning in Lofoten, Norway, a magnetic observatory picked up unusually pure low-frequency waves rippling around the Arctic Circle. Known as 'pulsations continuous (Pc)', these rare magnetic oscillations can energise particles in our planet's magnetosphere, boosting the brightness of aurorae. Indeed, strong auroras are being seen right now in Scandinavia. Visit today's edition of Spaceweather to learn what caused these Pc waves and to monitor the ongoing display. How far away can you see a cherry red Tesla Roadster? Yesterday, a telescope in Chile spotted Elon Musk's electric car 3.7 million kilometres from Earth as it was passing by star cluster NGC 5694. Using orbital elements published by NASA, amateur astronomers are setting new distance records almost every day as they track the Roadster en route to the orbit of Mars. Visit today's edition of Spaceweather for updates and a movie of the Roadster and the star cluster. A G1-class geomagnetic storm is underway on February 19 as Earth enters a stream of fast-moving solar wind. G1-class storms are relatively minor and have little effect on satellites or global power grids. However, they can spark bright auroras around the Arctic Circle and confuse migratory animals that navigate using magnetism at high latitudes. Visit Spaceweather for more information and updates. On February 12, the magnetic canopy of sunspot AR2699 exploded, for more than six hours. The slow-motion blast produced a C1-class solar flare and hurled a coronal mass ejection (CME) almost directly toward Earth. NOAA forecasters say there is a 60% chance of minor G1-class geomagnetic storms with isolated periods of stronger G2 storming when the CME arrives on February 14 or 15. Visit Spaceweather for more information about this event and the possible visibility of aurorae. "It's the craziest thing I've ever captured in my telescope," says amateur astronomer Raymond Kneip. Last night, he photographed Elon Musk's cherry red Roadster 430 000 kilometres from Earth, heading toward the orbit of Mars. NASA has just released an ephemeris (celestial co-ordinates) for the electric car, allowing astronomers to track and photograph the Tesla as it recedes into deep space. Pictures of the Roadster and instructions for accessing NASA's ephemeris may be found on today's edition of Spaceweather . The first remarkable Space-X mission in which a rocket with two boosters was flown to the threshold of space can be viewed here . Both boosters detached and returned to Earth, landing simultaneously in vertical positions, while the main rocket landed safely, also vertical, on a ship at sea. I kid you not. With Solar Minimum right around the corner, sunspot counts are at an almost ten year low. So it came as a surprise yesterday when a relatively large sunspot emerged near the sun's eastern limb. AR2699 has a primary dark core larger than the Earth with many smaller magnetic condensations trailing behind it, in all stretching more than 75 00 km across the sun's surface. Rare "solar minimum sunspots" are capable of intense explosions just like sunspots during more active phases of the solar cycle. Visit today's edition of Spaceweather for more information and updates. In 2005, a NASA spacecraft named IMAGE mysteriously went silent, abruptly ending a successful mission to study Earth's magnetosphere. Thirteen years later, it's back. On January 20, 2018, an amateur astronomer in Canada picked up radio transmissions from IMAGE, alive after all. The satellite may have been chattering away at Earth for years unheard and unnoticed. Now NASA is working to regain contact and possibly revive a key asset for space weather research and nowcasting. Visit today's edition of Spaceweather for the full story. A G1-class geomagnetic storm is underway on January 14 as Earth enters a stream of fast-moving solar wind. G1-class storms are relatively minor and have little effect on satellites or global power grids. However, they can confuse migratory animals that navigate using magnetism at high latitudes and, moreover, may spark bright aurorae around the Arctic Circle. Visit Spaceweather for more information and updates. Beyond the orbit of Mars, an unusual blue comet is approaching the Sun. Every time astronomers look at Comet PanSTARRS (C/2016 R2), it has a different appearance. Daily images show gaseous jets waving wildly around the comet's core and dusty clouds billowing down the comet's tail. This hyperactivity comes despite the fact that the comet is located in a region of space where deep cold and feeble sunlight usually discourage such volatility. What's happening? The comet's blue colour is a crucial clue. Find the answer on today's edition of Spaceweather .